Wireless Traveler is a reseller of mobile telecommunication products, services and accessories. These General Terms & Conditions (herein after referred to as “GTC”) govern the relationship between Wireless Traveler (herein after referred to as” Wireless Traveler”) and the customer (herein after referred to as “Customer”). The Terms & Conditions apply to all services provided by Wireless Traveler to Customer. In any event, the valid and applicable Conditions are deemed to be accepted when the customer purchases and/or uses the products and services offered by Wireless Traveler (collectively “the Service” and/or “Services”) subject to the terms set out below.A copy of the Terms & Conditions is also published on the internet at www.wirelesstravler.com (herein after referred to as” the Website”) Wireless Traveler reserves the right to change the GTC and other contractual provisions at any time. If you do not wish to be bound by these terms and conditions then you may not use the Services. 2.1 Following receipt by Wireless Traveler of the appropriate payment from Customer, Customer shall be entitled to use the services provided by Wireless Traveler. 2.2 Customer agrees to be bound by the Terms & Conditions which shall apply to the Customer’s purchase and use of the Services. Customer acknowledges that he is aware that the GTC shall apply to all uses of Wireless Traveler’s products and Services. 2.3 The GTC commence at the time of purchase and are in force and continue during the use of the Service. 3.1 The Customer shall use the services and products lawfully and in compliance with the GTC and other contractual documents duly integrated to the contract. The Customer is responsible for all use of the Services by the Customer or any 3rd party (with or without permission of the Customer) and is wholly responsible to pay for the use of all Services and for all Charges associated with the Services. Please refer to the “Rates and Coverage” pages published on the website for prices and charges. 3.2 The Customer shall be responsible for ensuring that the Services are compatible with the Customer’s equipment and any hardware. Wireless Traveler shall have no liability or responsibility for the use of the Services or compatibility of the Services with any equipment, handset or technology that has not been supplied or authorized by Wireless Traveler. The Customer shall be responsible for all use of the Services including but not limited to devices, its proper configuration and installation, compliance with any regulations and applicable instructions issued either by Wireless Traveler and/or the equipment manufacturer. The preparation activities for installation of the Service, including but not limited to preparing and inserting interface cards, setting adequate protocols, as well as all relevant activities in support of the implementation of the Service shall remain under the sole responsibility of the Customer. Wireless Traveler does not provide any protection or guarantee and against any damage caused by any third party during installation or use of its service after it is purchased by the customer. 3.3 The Customer must comply with all reasonable security procedures and standards with respect to the Service. Wireless Traveler may communicate security issues to the Customer from time to time when abuse or misuse is observed or reported by others along with any and all general information related to the provision by Wireless Traveler of the Service by any means, including via the Website. c) not send or upload anything that infringes 3rd party intellectual property rights (unless you have permission). 3.5 You must inform Wireless Traveler immediately if customer’s Wireless Traveler product (“product”) is lost or stolen. Wireless Traveler will take all reasonable action to cancel any stolen or lost product within 72 hours of notification and subject to verification of account it may be subject to payment of an administration charge, Wireless Traveler will apply any outstanding balances to a replacement SIM card which has been purchased by the Customer as a replacement. Wireless Traveler is not responsible for any service fees, call costs or other cost incurred due to a lost or stolen product. 3.6 If customer purchases a SIM card from Wireless Traveler it is Customer’s responsibility to ensure that your mobile telephone handset is compatible with the Services that you purchase from us. This includes ensuring that your handset is ‘unlocked’ and is compatible with the network in the country where you wish to use it. SIM CARDS ARE NOT RETURNABLE UNLESS FOUND TO BE FAULTY. Prepaid airtime on SIM cards is not refundable. 3.7 If customer rents a device from Wireless Traveler they are responsible for that equipment from time of receipt to the time it is received by Wireless Traveler. Customer is responsible for any, loss or damage to the equipment as well as missing parts such as cables, plugs and accessories. Customer acknowledges and agrees that Wireless Traveler may levy the appropriate charge for the aforementioned and accordingly charge the appropriate amount to the customer’s card on file. Any missing USB cables, plugs, charges and accessories will charged to the customer’s credit card for the price listed on the Wireless Traveler website.No refunds will be applicable once the rental device has shipped to the customer and left the warehouse of Wireless Traveler. A $25 restocking fee applies to any rental refund, in addition to credit card processing fees for both the original purchase and the processing fee for the applicable refund, if any. 4.1 All equipment, prices and quantity are subject to availability and may be changed without notice or obligation. Prices do not include shipping and handling and applicable duties and taxes. Shipping and handling charges are additional and may vary. Orders are not considered valid until approved and authorized by Wireless Traveler. All prices are quoted in U.S. dollars. While Wireless Traveler uses reasonable efforts to include accurate and up-to-date information on the Site, Wireless Traveler makes no warranties or representations as to its accuracy. Wireless Traveler assumes no liability or responsibility for any errors or omissions in the content on the Site. 5.1 Wireless Traveler shall provide the customer with specific telecommunications products and services as indicated on its website. Service is provided in the countries published on the “Rates and Coverage” pages of the website indicated for the specific service. Customer should not assume that service is available in a specific country for any particular program unless indicated for that product or service. 5.2 Wireless Traveler shall use reasonable efforts to operate and maintain the Service, contingent upon Wireless Traveler’s and/or Wireless Traveler’s service provider’s ability to maintain necessary licenses or permissions, or Wireless Traveler’s and or Wireless Traveler service provider’s network capacity and connection availability. The network operator in the country of use will be responsible for network coverage and network availability. Wireless Traveler gives no warranties or guarantees as to network coverage or availability of any network or suitable coverage. Wireless Traveler will not provide a refund for any failure to make calls due to problems with network coverage. Wireless Traveler reserves the absolute right to refuse a sale or void an order placed if they feel that the decision is in the best interest of the company. 6.1 The Customer is solely responsible for all content, information and communications transmitted using the Services and shall indemnify Wireless Traveler for any loss or liability that Wireless Traveler may incur as a result of any content or material which is transmitted using the Services. 6.2 When travelling outside of their country the customer may be subject to different laws and regulations that apply for the services. Wireless Traveler is not liable for customer failure to comply with those laws or regulations. 6.3 Customer shall not use the Service or permit any use of the Service which is illegal, unlawful, or harassing, which infringes upon the intellectual property rights of third parties, or which otherwise constitutes network abuse, and the Customer shall be responsible for any such misuse of the Service. The Customer shall indemnify Wireless Traveler against all any liabilities, claims, actions, liabilities, loss, damage, costs and expenses suffered or incurred by Wireless Traveler as a result of any breach of the Customer’s obligations or warranties in this Agreement. 6.4 Customer warrants that it shall comply with any laws, regulations or conventions which may be applicable to the use of the Service and with any public policy related laws, which may be applicable to the use of the Service by third parties (such as privacy laws and laws relating to defamation, libel and decency with respect to the content of the communications transmitted using the Service). 6.5 The Customer acknowledges that a breach of the obligations and/or warranties contained in this Agreement could lead to a claim or liability or disruption in the provision of the Service by Wireless Traveler. In the event of such breach, Wireless Traveler shall be entitled to suspend the performance of the Services to the Customer and its obligations under this Agreement, until the breach has been remedied and in addition shall be entitled to exercise its rights of termination under this Agreement. 7.1 Any and all rights attached to the telephone number or URL address attached to the Service provided to you by Wireless Traveler remain vested in Wireless Traveler. All phone numbers allocated to your service(s) are to be considered temporary. Accordingly, Wireless Traveler may change, withdraw or otherwise alter such telephone number or any other address-element at its discretion, without damages payable to Customer, should any technical, commercial reason as well as any applicable regulations so require. 7.2 The SIM Card, all technology and intellectual property as part of the SIM Card remains the property of or is licensed to Wireless Traveler, which grants to you a non-exclusive license to use the Services and preserves Wireless Traveler’s rights to alter and develop its content as well as claiming its return. Your temporary number may not be ported for any reason. 8.1 Customer agrees to pay all applicable charges for the Services in accordance with the applicable Price List in force at the time of using the services and available on Wireless Traveler website. In particular, Customer agrees with such charges being directly deducted from its credit card account. 8.2 Wireless traveler only offers a prepaid service and all charges for the use of service will be deducted from the customer’s credit card. 8.2 The applicable rates that apply for use of the Services shall be the ones duly published on the Website at the time of using the SIM Card. Separate applicable rates apply for the WiFi Calling Apps. 8.3 Wireless Traveler reserves its rights to increase and/or make any other change to the applicable charges at any time. Wireless Traveler shall give notice by publishing any increased rates or charges on its Website. 8.4 The prices shall be quoted in US dollars and may be subject to applicable sales taxes, duties or levies imposed by any authority, government or governmental agency. a) Call Connection Fee for SIM cards and Phones only – for each completed outgoing call there is a $.30c connection fee charged on a per call basis. This connection fee does not apply to any of the WiFi Calling Apps. b) For each completed incoming call on SIMs and Phones only there is a $.30c connection fee charged on a per call basis. This connection fee does not apply to any of the WiFi Calling Apps. c) A onetime activation fee of $12 is charged when customer first activates his account for SIMs and Phones only. This does not apply to WiFi calling apps or Data programs. 8.7 Wireless Traveler considers its charges and pricing to be generally competitive compared to certain other similar services and products. Wireless Traveler makes no warranty or guarantee whatsoever that it provides its services at the lowest prices available in the market. 8.8 SHIPPING &HANDLING, IMPORT DUTIES, TAXES – Rates for shipping quoted on Wireless Traveler website are based on shipping within the USA (and Canada where indicted) . Wireless Traveler utilizes third party companies such as FedEx, UPS and US Mail service to deliver its physical products. Wireless Traveler is not responsible for any late deliveries including but not limited to delays caused by errors and omissions by the carriers, delays in customs clearance, bad weather, power outages, acts of god or terrorism. Wireless Traveler is also not in any way responsible for any duties or taxes levied by customs of the country that customer requested product to be shipped to.. Shipping quotations may be requested for Special for orders for multiple devices and international shipments. . Shipping and handling charges are non-refundable. Shipping and Handling Rates are subject to change without prior notice. 9.1 Warranty. When purchasing products from Wireless Traveler, the product(s) are warranted from defects in material and workmanship. Should these items fail under normal use during this time period, Wireless Traveler will, at its sole discretion, repair or replace the defective item with a like or similar product. If the unit cannot be repaired and a replacement unit is not readily available, Wireless Traveler, at its sole discretion may refund the purchase at the current market price in accordance with its refund policy referred to below. Refunds or credits are not offered when the devices may be repaired or a replacement unit is available. This warranty does not cover accident, misuse, abuse, negligence or modification of, any part of the product, including the antenna. 9.2 AIRTIME EXPIRATION – All prepaid airtime funds purchased for Wireless Traveler global SIM cards will expire thirteen (13) months from the first day the funds are placed onto the account. Wireless Traveler Service operates on a pre-pay basis and in all cases you will be prompted to pay these rates in advance. Wireless Traveler has no obligation to refund any payments made in advance as set out in these terms. Any subsequent funds added to that account will be valid for a full thirteen (13) months from the date they were added to the account. Expired airtime funds are non-refundable. For the avoidance of doubt “airtime funds” means the amount of money placed on a Wireless Traveler customer account for voice, text and/or data services. Any unused airtime on rental phones or sim cards will be expired at the end of the rental period. Expired and/or unused airtime funds are non-refundable. All prepaid airtime funds purchased for WiFi Calling appswill expired twelve (12) months from the first day the funds are placed on the account. The app itself will expire after 12 months and a new WiFi calling App will need to be purchased and airtime added for a further twelve (12) months. 9.3 DATA EXPIRATION – All prepaid data bundles purchased for Pocket Wi-Fi or sim cards will expire 30 days from the time of purchase. Any subsequent funds added to that account during the initial 30 days will be valid for 30 days from time the new bundle was added to the account. For the avoidance of doubt “prepaid airtime funds” or “prepaid data bundles” means the amount of money placed on a Wireless Traveler customer account for either voice, text or data services. Any unused data bundles on phones, sim cards or pocket Wi-Fi will expire 30 days from time of purchase or in the case of rentals at the end of the rental period. Expired airtime funds are non-refundable. 9.4 Data airtime recharges are only set with the specific instruction by the customer at the time of purchasing the initial 30 day bundle. Customer sent a confirmation email immediately after purchase. Under no circumstances is Wireless Traveler responsible for “accidental” and/or “unintentional” and/or unauthorized use of any data bundle. 9.5 Complimentary Airtime. Where Wireless Traveler provides customer with free calls or other special offer services no cash alternative will be given. 9.6 No refunds will be given for any cancellation of rental orders made less than 24 hours prior to the agreed rental period. 9.7 Once the rental period has started, there are no refunds. 10.1 Where customer has purchased Services via our the website, you may cancel the purchase of our Services and return any SIM card and any associated products un-used and unopened within 7 days of receipt of the goods by you. Any return of these goods shall be at customers cost. If customer wishes to cancel the service they may contact Wireless Traveler at support@wirelesstraveler.com. Cancellations may be subject to cancelation and processing fees. 10.2 Wireless Traveler will not accept returned products if they have been used in any way or if the packaging has been tampered with. 10.3 When Wireless Traveler receives the returned products Wireless Traveler will access and based on assessment, refund to customer the cost of the products which will be refunded within thirty (30) days. There is NO refund for rentals once they have been shipped and left the Wireless Traveler Warehouse. The customer is required to inform Wireless Traveler prior to shipping of a cancellation for a refund. A $25 restocking fee per device will apply in addition to credit card process fees for BOTH the original charge and the refund. 10.4 Customer is responsible for arranging to return the products to Wireless Traveler at customers own cost. While in customer’s possession, customer must keep the products in good condition. The products must be returned to Wireless Traveler in their original packaging. If customer does not return the products to us, Wireless Traveler reserves the right to charge customer for the cost of recovering the products. 10.5 In any event that any products that are returned for refund and where at Wireless Traveler’s sole discretion agrees to issue a refund, a deduction of a $25 restocking fee per item will be calculated into any amount that Wireless Traveler has allowed to be refunded. 10.6 Shipping and handling costs are non- refundable including and not limited to Saturday delivery, shipments that are refused or are undeliverable due to the incorrect address being provided. If customer’s order was part of a Free or Discounted Shipping Special offer and customer decides to return the product Wireless Traveler reserves the right to charge for the actual shipping amount and deduct that amount from any amount refunded. Shipping and handling charges are non-refundable. 10.7 Complimentary call value is non-refundable and cannot be exchanged for cash. 11. Wireless Traveler Service operates on a pre-paid basis and you will be prompted to pay these rates in advance. Wireless Traveler has no obligation to refund any payments made in advance. 11(a) UNUSED PREPAID AIRTIME AND PREPAID DATA IS NOT REFUNDABLE. 11(b) Cancelling an order that includes prepaid data or prepaid airtime – If a rental or purchase order is cancelled after it has been shipped and that order includes prepaid airtime and/or prepaid data, the charge made for the data and/or the airtime is NOT REFUNDABLE. 11(c) Where Wireless Traveler provides you with free calls or other special offer services no cash alternative will be given. 11(d) No refunds will be given for any cancellation of rental orders made less than 24 hours prior to the agreed rental period. 11(e) Once the rental period has started there are no refunds. 11.1 Wireless Traveler provides Services solely on a prepayment basis. Should any payment remain outstanding, Customer shall remit such amount within seven (7) days from Wireless Traveler’s request. In case of lack of payment without the above period of time, Wireless Traveler may immediately suspend the Service pending remittance by the Customer of such due payment. Failure to make any payment may result in termination of the Services to the Customer. 11.2 Payment shall be considered as effected when Wireless Traveler receives authorization from its credit card processing provider or receives the applicable cleared funds for the full amount due in its bank account. (iii) the Customer fails to comply with payment obligations including non payment for services which includes but is not limited to customer’s credit card authorization being declined. (v) for a violation of Wireless Traveler’s acceptable use policy or for other behavior that in Wireless Traveler’s reasonable discretion may be deemed to be illegal; or (vi) in order to protect Wireless Traveler, at its sole discretion, from legal liability which relates to a breach of obligation and/or warranties by the Customer. (vi) at Wireless Traveler’s sole discretion including but not limited to Wireless Traveler deems that the relationship with the customer is untenable or could be potentially detrimental to Wireless Travelers reputation. 13.1 The Service is provided on an “as is” and “as available” basis and there is no warranty that the Services are or will be free of faults. In the event of a fault, Wireless Traveler, upon becoming aware of the fault or upon receipt of notice of the existence of such a fault by the Customer, shall use its reasonable efforts to promptly correct the fault in accordance with standard engineering practices recognized in the industry. 13.2 Wireless Traveler makes no express or implied warranties, representations or endorsements regarding any merchandise, information, products or services provided. An entire fault free service cannot be guaranteed, and that within national and international telecommunications networks faults and errors cannot be excluded. 13.3 Wireless Traveler shall not be liable to the Customers and/or its customers for any direct or indirect loss or damage, loss of opportunity or business or indirect losses whatsoever or howsoever arising (including economic losses or any loss of profit) arising out of or in connection with the performance of its obligations under this Agreement. Without prejudice to the generality of the foregoing, it is acknowledged that the aforesaid exclusion of liability shall extend to any personal injury or death caused on account of the negligence of Wireless Traveler. 13.4 For the avoidance of doubt, under no circumstances shall Wireless Traveler be liable for any direct, indirect or consequential damages, including but not limited to damages that result from the Customer’s use of or inability to use any part of the Services or the Customers’ reliance on or use of information, services merchandise provided on or through the Service or damages that result from mistakes, omissions, interruptions, loss, theft, or deletion of files, errors, defects, delays in operation, or transmission, or any failure of performance. 14.1 Neither party can be held liable for whatever damage incurred by the other party in case the party concerned should not comply with its commitments in connection with the present agreement due to a situation of force majeure. 14.2 Are regarded as force majeure, unexpected circumstances in relation with persons and/or material used or normally used by Wireless Traveler concerned to carry out the present agreement, and which are of such a nature that execution of the present agreement becomes impossible, or burdened and/or disproportionately expensive that punctual compliance with the present agreement cannot reasonably be expected from Wireless Traveler. Are also regarded as force majeure any events beyond Wireless Traveler’s reasonable control. Wireless Traveler will not be responsible for loss or damage suffered by Customer as a result of Wireless Traveler’s failure to perform its obligations under this Agreement due to force majeure. 14.3 Will be regarded as force majeure, without this list being limited, strikes, company blockades, epidemics, natural disaster and legal or administrative restrictions. 14.4 Should the Force Majeure event exceed a 3 (three) month period the Agreement may be terminated with immediate effect. 15.1 Wireless Traveler will grant the Customer a personal and non-exclusive license to use any of the software and documentation regarding the service supplied by Wireless Traveler during the present agreement. Wireless Traveler and its licensors, if any, will always possess the rights, property rights and interests in and in relation with the supplied software and documentation, including any intellectual property rights related thereto. Wireless Traveler undertakes to process customer data with care and to comply with the provisions of the prevailing regulations. Wireless Traveler only collects, stores and processes the data required for the provision, design and development of the service, for handling and maintaining customer relations, operational reliability and infrastructure, and for invoicing purposes. If Wireless Traveler provides services jointly with a third party, in particular calls to networks of other service providers, or if the customer receives services from third parties via the Wireless Traveler network, Wireless Traveler may exchange the customer’s data with such party insofar as such information is necessary for the provision or execution of these services. 17.1 Wireless Traveler expressly reserves its rights to modify, at any time, parameters of its services as well as these General Terms and Conditions. 17.2 The Customer shall be given notice of any significant changes, modifications, variations on its the Website and the Customer is advised to regularly monitor the Website www.wirelesstraveler.com. The Customer agrees that an appropriate publication on the Website is an acceptable notice. 18.1 This Agreement shall be governed by, construed and enforced in accordance with the laws of the State of Maryland, USA. 18.2 The Agreement has been executed in the English language, which language shall be controlling in all respects. No translation, if any, of the Agreement into any other language shall be of any force or effect in the interpretation of the Agreement or in the determination of the intent of either of the Parties. 20.1 Failure by either party to enforce any of its rights under this Agreement shall not be taken as or deemed to be a waiver of that right nor shall it deprive that party of the right to insist on adherence to that term at some other time. 20.2 Wireless Traveler remains free to assign rights and duties contained in this Agreement to a third party. 20.3 The Agreement supersedes any and all other agreements, oral or written, between the Parties with respect to the subject matter hereof. Both Parties acknowledge that they have not entered into the Agreement in reliance on any representation made but not embodied in the Agreement. 20.4 The Parties agree that any terms or conditions in this Agreement which might be ruled by any competent authority as illegal, void, unenforceable or invalid shall be replaced by terms and conditions expressing the stipulations as close as possible to the original terms and conditions by only removing the existing obstacle. 20.5 Our Sim Card based products support voice, data and text services. It does not support MMS (both sending and receiving). WIRELESS TRAVELER (Wireless Traveler, Inc) and the customer (“Customer”) hereby agree to the following terms and conditions with respect to the provisions by WIRELESS TRAVELER to Customer of the rental equipment, which are identified and/or described in the Rental Agreement, attached to these terms and conditions. 1. If the Customer is an entity other than an individual, then the person signing the Agreement represents and warrants that the individual has been properly authorized and empowered to enter into the agreement on behalf of the entity. 2. WIRELESS TRAVELER will deliver the rental equipment, at its own risk, to the address designated by the customer. 3. WIRELESS TRAVELER will use reasonable efforts to deliver the equipment by the requested delivery date but it shall not incur any liability to the Customer in the event of any delay caused by forces and/or other circumstances beyond its control. 4. The Customer will accept the equipment when delivered on or before the delivery date, and if for any reason the Customer fails to accept the package when delivered on or before such date the Customer shall nevertheless be liable for the stated Rental Charge in full, and for the proper and timely return of the rental equipment to WIRELESS TRAVELER. 5. The Customer will prepay for the rental charge and selected airtime from the departure date specified on the equipment rental order form until the end of the rental period. 5(a). Wireless Traveler at its sole discretion will allow 3 day ‘rent free’ grace period for customer to return the equipment to Wireless Traveler. 5(b). If equipment is not received by Wireless Traveler equipment after the 3 day grace period has ended late fees will be charged to the customer for each day Wireless Traveler has not received all of the rental equipment. 5(c). Customer must return the equipment to WIRELESS TRAVELER facility as described in documentation provided with the equipment. 5(e). In the event that the equipment is not returned after 30 days following the last day of the contracted rental period and customer has not advised WIRELESS TRAVELER of and paid for an extended rental period WIRELESS TRAVELER will consider the device as lost or stolen and will charge customer for the replacement of that equipment, accessories, instruction manuals and packaging. This will be in addition to any late fees and interest charges that are due. 6. Equipment rental charges apply to full days. 7. WIRELESS TRAVELER may increase the call charges as and when it deems appropriate. However, WIRELESS TRAVELER will attempt to provide the Customer with reasonable notice of any impending change as soon as it becomes practically possible. rental period, such as, but not limited to: Airtime usage, Data usage, SMS Messaging. The Customer is responsible to safe guard the rental equipment and will be responsible for all charges incurred, whether or not Customer personally makes the calls for which the charges are imposed. 10. All unpaid amounts due to WIRELESS TRAVELER under this agreement are payable at the latest by the end of the rental period and WIRELESS TRAVELER shall be entitled to charge interest at the rate of 2% per month (or part of a month) on any overdue amounts. 11. Wireless Traveler Service operates on a pre-pay basis and you will be prompted to pay these rates in advance. Wireless Traveler has no obligation to refund any payments made in advance. Unused prepaid airtime is not refundable. Where Wireless Traveler provides you with free calls or other special offer services no cash alternative will be given. 12. WIRELESS TRAVELER is reliant on in country cellular telecommunications networks to provide cellular connectivity to the rented device. WIRELESS TRAVELER is not responsible for customer being able to receive cellular service in any location where the customer is located. WIRELESS TRAVELER is under no obligation to refund any payments due lack of cellular coverage. 13. Payments for any orders cancelled before the order has been shipped by WIRELESS TRAVELER will be refunded less a $15 refund administration fee. 13(a). Orders cancelled within 72 hours after the order has been shipped will be refunded less $25 dollar a restocking fee. Shipping charges will not be refunded and cost of shipping for returning the equipment will be borne by the customer. 13(b). Orders cancelled after 72 hours from the time of the order was place are non- refundable and all Terms and Conditions apply. 14. Upon delivery to the Customer WIRELESS TRAVELER will provide instructions and guidelines on the use of the equipment. 15. The Customer will use the equipment in a careful and proper manner, in accordance with the instructions, and in no other manner. (a) Effect any repairs or modifications to the equipment. (e) Attempt to dispose of the equipment or to grant any interest in the equipment to any third party. 17. If the equipment is not in working order when delivered or subsequently malfunctions, the Customer will notify WIRELESS TRAVELER or its designated representative immediately. 18. WIRELESS TRAVELER will repair or replace the equipment as soon as possible after it has been notified of the problem by the Customer and, provided the Customer is not in breach of the rental agreement, WIRELESS TRAVELER will provide the Customer with the same or similar rental equipment as soon as possible for a period equivalent to the part of the rental period un-expired when the malfunction occurred. 19. If WIRELESS TRAVELER finds that equipment reported as faulty is actually in working order then the Customer will pay the cost of collection and delivery of the replacement equipment. 20. WIRELESS TRAVELER warrants that the rental equipment will be in working order when delivered to the Customer but cannot be responsible for the performance of the equipment or the operation of the telephone network to which it is connected. 21. WIRELESS TRAVELER MAKES NO OTHER WARRANTIES, GUARANTIES OR REPRESENTATIONS, EITHER EXPRESS OR IMPLIED, REGARDING ANY MATTER, INCLUDING WITHOUT LIMITATION, THE MERCHANTABILITY, ACCURACY, RELIABITY, CONDITION OR FITNESS FOR A PARTICULAR PURPOSE OF THE EQUIPMENT OR SERVICES FURNISHED UNDER THIS AGREEMENT. SUBJECT TO THIS AGREEMENT ( see Theft & Loss Protection) THE CUSTOMER SHALL BE SOLELY RESPONSIBLE FOR AND SHALL INDENIFY AND HOLD WIRELESS TRAVELER HARMLESS AGAINST ALL CLAIMS, DEMANDS AND LIABILITY ARISING AS A RESULT OF LEASE, POSSESSION, USE, CONDITION, OPERATION OR MISUSE OF THE EQUIPMENT OR PHONE SERVICES PROVIDED HEREUNDER WHETHER IN BREACH OF THIS AGREEMENT OR HOWEVER IT ARISES. WIRELESS TRAVELER WILLIN NO EVENT BE RESPONSIBLE FOR ANY LIABILITY, CLAIM, LOSS, DAMAGE OR EXPENSE OF ANY KIND (INCLUDING LOST PROFITS) WHETHER DIRECT, INDIRECT OR CONSEQUENTIAL CAUSED BY THE EQUIPMENT OR THE FAILURE OF THE EQUIPMENT TO OPERATE CORRECTLY OR AT ALL. 22. The Customer shall be liable to WIRELESS TRAVELER for all expenses, including reasonable attorney’s fees, incurred in connection with any collection, repossession or other action brought to enforce WIRELESS TRAVELER right to deactivate the equipment at any time and without notice to the Customer, in the event that WIRELESS TRAVELER rights under this agreement. WIRELESS TRAVELER reserves the right to deactivate the rental equipment at any time and without notice to the customer, in the event that WIRELESS TRAVELER detects unusually high usage or possible fraud in accordance with general operating practices and procedures in the international cell industry, and WIRELESS TRAVELER shall have no liability whatsoever to the Customer for such deactivation. 23. The rental equipment, including the transceiver and all accessories will at all times remain the property of WIRELESS TRAVELER. The Customer acquires no rights other than temporary use. During the rental period, no service or part replacements are authorized without written approval from WIRELESS TRAVELER. The Customer agrees that he/she has examined the equipment and that the equipment is in good working order at the time of receipt. 24. Unless otherwise agreed with WIRELESS TRAVELER the Customer shall return the equipment to WIRELESS TRAVELER at the end of the rental period in good working order and in the same condition as when it was delivered to the Customer. The Customer shall return the equipment by Federal Express or comparable overnight courier to the designated WIRELESS TRAVELER address and in accordance with shipping instructions provided by WIRELESS TRAVELER at time of delivery of the equipment. Should the Customer return the equipment using means other than those specified in the instructions provided by WIRELESS TRAVELER at the start of the rental, rental and other charges will continue, and the Customer will remain liable for any damage to the equipment, while the equipment is in transit. Packages returned with any components or pieces missing from the package (kit) provided will continue to be charged full rental until all such missing components or pieces are returned or replacement value of the equipment is paid. (d) Otherwise commit a breach of these terms and conditions then WIRELESS TRAVELER may, at its option and in addition to other remedies available hereunder at law or in equity, (i) terminate this agreement; (ii) immediately terminate all services to the Customer, and (iii) take immediate possession of the equipment without being obliged to repay any portion of the rental charges. No remedy of WIRELESS TRAVELER shall be exclusive of any other remedy whether provided herein or available at law or in equity, but shall be cumulative with other remedies. 26. The Customer shall pay the manufacturer’s full retail price to WIRELESS TRAVELER for any international cell phone or other rental equipment that is damaged or not returned at the end of the rental period. d.
27. The laws of the State of Maryland shall govern this agreement. 28. The headings in this agreement are for convenience of reference only and shall not affect the meaning or construction of the terms and conditions contained herein. 29. No waiver by WIRELESS TRAVELER of any breach of this agreement shall be considered as a waiver of any subsequent breach of the same or any other provision hereof. This agreement cannot be assigned or transferred by the Customer, nor can this agreement be modified (or any provision waived or modified) except by written instrument signed by WIRELESS TRAVELER or its authorized agent. This agreement constitutes the entire agreement between WIRELESS TRAVELER and the Customer; there are no other representations, conditions, warranties, guarantees, or collateral agreements, express or implied, statutory or otherwise, concerning the use or rental of the equipment and/or accessories, other than as set forth herein. SPS agrees to rent to Customer, and Customer agrees to rent from SPS, the mobile satellite equipment (hereafter designated “Equipment”) described above for the term of the Effective Dates of Rental, except as otherwise provided herein. The Customer agrees to use the rental equipment with SPS’ inmarsat services. The term of this Agreement begins on the Effective Date, as shown above, and except as otherwise provided herein, will continue until the equipment is returned to SPS as noted in the terms of the effective date and return grace period. 3.1 Rental Charges – Customer agrees to pay rental charges and any other applicable fees IN ADVANCE prior to shipment to designated shipping address. A security deposit reserve as noted in Section 4.2 will be required as security for the return of the equipment in good condition. This deposit is not a charge and Customer agrees to provide such deposit by signing this agreement. The customer will pay additional daily rental fee beyond the rental period. Customer’s credit card will also be charged the applicable airtime charges plus surcharges & fees of 9.75% Inside FL and 2.75% Outside of FL. SPS will either present customer with an itemized call detail record for all calls made by the rental phone usually within 30 to 90 days after the end of the rental. Until SPS receives the Equipment, the Customer shall remain bound by the obligations of this Agreement. 3.2 Security Deposit/Reserve – A charge for a security deposit/reserve is required for all Inmarsat BGAN rental orders. The charge will be placed against the Customer’s credit card on or before the Effective Date. This deposit may be retained by SPS and will be applied against Customer’s account balance for payment of rental charges, airtime, damages, loss of the Equipment, or any other payment owed to SPS by the Customer. Once the account has been finalized and charges paid, any remaining deposit will be credited back to same credit card. When renting multiple terminals deposits for each terminal will be charged. 3.3 Test and/or Repair Charge – If returned equipment appears broken due to Customer misuse, a test and repair charge of up to $50.00 may be charged for inspection, testing and minor repairs required to return the Equipment to service. This charge will be payable at the end of this Agreement. If the terminal cannot be repaired, the customer will be notified and held responsible for the specified replacement cost of the terminal. If insurance was purchased, this charge will apply to deposit. 3.4 Other Costs – In addition to the applicable equipment rental charge and airtime, the Customer also agrees to pay for any additional equipment selected above. Any and all shipping costs to transport Equipment between the Customer and SPS or its designated storage location(s) are the responsibility of the Customer. Specified shipping charges outlined above are rates for the Continental United States only. SPS utilizes UPS, USPS, and sometimes other curriers for rental shipments. 3.5 Data transmission use & Dropped Calls – Due to the technical nature of data setups and the inherent sophistication of data transmission through a variety of operating systems, SPS makes no representation as to the success of data calls through the system. Customer agrees that all data call attempts, regardless of ultimate successful transmission and termination, will be paid for. No credit will be given in the event of disputes of this nature. Along with potential incorrect use such as attempted use next to a building or other obstruction, the Inmarsat system has inherent flaws and anomalies that can create dropped calls of either voice or data nature. Dropped calls will not be credited. SPS can provide data setup technical support beyond the normally provided setup instructions at an additional charge. Please consult with a sales representative for more details. 3.6 Taxes, etc. – Customer will either pay directly for any taxes or governmental fees such as use, property, excise, customs duty or other taxes, license fees, assessments, permits or commissioning and registration fees relating to the shipment, activation and rental of the Equipment. Customer shall be responsible for obtaining any license, permit or permission from any governmental or regulatory agency which may be necessary for or imposed upon the operation of the Equipment. Operation is legally allowed in many countries, including those outlined in the SPS website www.satellitephonestore.com (“About Iridium” section). The Customer will exercise due care with and will permit only qualified personnel to use and operate the Equipment. Such use and operation shall be only according to written instructions provided by SPS. Customer will not use or operate the Equipment in any illegal manner or for any illegal purpose nor in violation of any law, ordinance or regulation. The Customer will keep SPS advised of the changes to the specified Equipment’s site or usage location. The Customer will permit SPS or its Agent to inspect the Equipment during the term of this agreement with any reasonable notification – if said agent determines that equipment has been returned in poor or damaged condition, a $130 charge not including equipment repair may be charged. The customer also permits SPS to charge immediately for any damages to equipment, the charges will include the cost of repair or replacement equipment. SPS warrants that each item of equipment will be suitable for normal operation and use at the time of delivery. SPS MAKES NO OTHER REPRESENTATION OR WARRANTY OF ANY KIND, EXPRESSED OR IMPLIED, WRITTEN OR ORAL, AS TO ANY MATTER WHATSOEVER. SPS DISCLAIMS ANY AND ALL IMPLIED WARRANTIES OF MERCHANTABILITY OR FITNESS FOR ANY PARTICULAR PURPOSE. 6.1 Ownership – Customer acknowledges that SPS is and shall remain the owner of the Equipment until title is conveyed to the Customer by an attached separate lease/sale or sale agreement. Customer will protect SPS’ ownership rights against claims, liens and other encumbrances by Customer’s creditors or other claimants against Customer. Customer will not remove, obliterate or obscure markings which identify SPS as owner of the Equipment. 6.2 Security Interest – Customer will execute and deliver to SPS documents and forms which are reasonably necessary or desirable to protect SPS’ ownership and interest in the Equipment, including financial statements as specified under the Uniform Commercial Code. 7.1 Insurance – SPS offers insurance against equipment damage if selected on equipment accessories section, but not against loss. Customer may seek their own insurance against loss from their Home/Business or other insurance providers. (II) Request that SPS repair or replace the damaged or lost equipment, and pay to SPS the cost of such repair or replacement. In such case, the rental charges and other obligations of the Customer shall continue during the period of repair or until replacement. If SPS is unable to repair or replace the equipment then option (i) shall apply. In any case, the amount to be paid to SPS shall be reduced by any applicable insurance proceeds paid to SPS. 8.1 Normal Maintenance – SPS or its authorized agent will be the exclusive source to maintain the Equipment and will maintain the Equipment in operational condition. Customer will deliver the Equipment to SPS or its agent for maintenance and Customer will pay all costs for shipment to SPS or its agent and shall be liable for any loss or damage during transportation. SPS or its agent will return the Equipment to the Customer and shall be liable for any loss or damage during transportation. When available, and as requested by the Customer, maintenance may be affected at the Customer’s location; in which case Customer will pay for the transportation and labor costs of SPS or its authorized agents in accordance with the standard rates in effect. Such maintenance will be provided without charge to Customer for malfunctions and failures due to manufacturing defects and normal wear and tear. Maintenance required for other malfunctions and failure or damage caused by improper power source, abuse, accident, improper operation, abnormal conditions of operation, or other Customer misuse is covered under Section 8.2. NOTE: USE OF ERRATIC POWER WILL DAMAGE EQUIPMENT. THIS IS OF PRIMARY IMPORTANCE IN COUNTRIES WHERE CONSISTENT POWER SUPPLY IS NOT AVAILABLE. CUSTOMER-PROVIDED AUXILIARY POWER GENERATOR SHOULD BE CONSIDERED & MAY BE REQUIRED. Malfunction or failure of operation covered by this section will entitle the Customer to a reduction in rental charges on a pro-rated basis for a period commencing on the day the malfunction or failure is reported to SPS in sufficient detail to enable SPS or its agent to commence necessary repairs, and ending on serviceable condition. In no event will SPS be liable for any loss of profits, indirect, consequential or other damages resulting from any failure of the Equipment. The customer will not open the Equipment’s housing, alter or repair or permit the alteration or repair of the Equipment, or make any attachments thereto, without the prior written approval of SPS Whenever Communications LLC. 9.1 Limitation of Liability – In no event will SPS be liable to the Customer for any incidental, indirect or consequential damages, regardless of cause. 9.2 Indemnity -The Customer agrees to protect, indemnify and hold harmless SPS from and against all claims, damages and costs including legal expenses arising out of the Customer’s use of this Equipment. If Customer fails to perform any obligation specified under this Agreement or otherwise defaults, SPS has the right to terminate this Agreement forthwith by notice to the Customer. Upon such termination, (i) the balance of the Gross Rental Amount will be due and payable immediately, and (ii) SPS has the right, at its discretion, to take possession of and remove the Equipment from service immediately. 1. Issuance of writ, attachment, execution, or similar court process against the Customer or its property. 2. Bankruptcy or any application for reorganization, protection from creditors, insolvency, appointment of a receiver or trustee whether voluntary or involuntary. 3. Termination of the Customer’s business. 5. Failure to use the SPS network or to pay communications service invoices on time. 6. Change in management or ownership of the Customer. 7. Any action which jeopardizes SPS’ ownership or agent / partner’s ownership rights or ability to take possession of the Equipment. All notices and other communications required or permitted to be given under this Agreement will be in writing and will be effective when delivered personally, when sent by confirmed fax, U.S Mail, or by certified courier addressed to the parties at their respective addresses set forth below, unless by such notice a different person or address shall have been designated. 13.1 Early Returns – Under no circumstance will Customer be granted credit for unused time or early return of equipment as it pertains to the effective date of rental. 13.2 Export Regulations – The Customer will not engage in exporting, diverting or re-exporting Equipment in a way inconsistent with U. S. export laws. 13.3 Excusable Delays – If SPS’ performance of any obligation hereunder is delayed due to reasons beyond SPS’ reasonable control, the time for performance of such obligation will be postponed for a period equal to the number of days of such delay. In no event will SPS be liable for any damages resulting from any delay in the delivery of Equipment or any delay in the performance of maintenance. 13.4 Previous Agreements – This Agreement supersedes all prior and contemporaneous agreements and representations made with respect to the same subject matter, and is the entire Agreement between the parties. 13.5 Severability – In the event that any one or more provisions contained in this Agreement should for any reason be held to be unenforceable in any respect under the laws of the state of Florida or of the United States, unenforceability shall not affect any other provisions of this Agreement and this Agreement shall be construed as if such unenforceable provision had not been contained herein. 13.6 Controlling Law – All questions concerning the validity, operation, interpretation and construction of this Agreement will be governed by and determined in accordance with the laws of the Florida. 13.7 Headings – The headings and titles to the section and paragraphs of this Agreement are inserted for convenience only and will not be deemed a part hereof or affecting the construction or interpretation of any provisions hereof. 13.8 Counterparts – This Agreement may be executed in one or more counterparts, each of which shall be deemed to be an original copy hereof. 13.9 Further Assurances – The parties agree to perform all acts and execute all supplementary instruments or documents which may be necessary or desirable to carry out the provisions of this Agreement. The International Calling Application for Smartphones (“App”), which is provided by Wireless Traveler LLC (“Wireless Traveler” or “We”), provides callers with the ability to make international calls using two (2) different call types, (i) VoIP over WiFi, and (ii) VoIP over Data Network. Please read this Agreement carefully before accessing or downloading the App to your Smartphone. The herein terms apply to the App with which this Agreement is provided, and includes any Documentation. By downloading the App, You agree to be bound to the terms and conditions set forth herein. If You do not wish to be bound by these terms and conditions, you may not download the App. We may modify this Agreement at any time without notice and such modifications shall be deemed effective immediately upon posting of the modified Agreement. You agree to review the Agreement periodically to be aware of such modifications and Your continued access or use of the App shall be deemed your conclusive acceptance of the modified Agreement. 1.2 Documentation: The printed materials, “online” or electronic documentation, packaging and any other materials in any other media or form associated with the App. 1.3 App: Wireless Traveler s licensed and/or proprietary App software application for Smartphones, as well as any future fixes, enhancements, updates and upgrades thereof. 1.4 Smartphone: a mobile phone offering advanced capabilities, including personal computer-like functionality (PC-mobile handset convergence) or a palmtop computer. 1.5 You: you, the end user of the Software, also used in the form “Your” where applicable. 2.1 Grant of License. Subject to the herein terms, the App and Documentation are licensed, not sold, to You by Wireless Traveler, on a non-exclusive basis and Wireless Traveler reserves all rights not expressly granted to You. The rights granted to You herein are limited to Your license to use the App pursuant to the terms of this Agreement and do not include any other right in any other patents or other intellectual property. The terms of this Agreement will govern any software upgrades provided by Wireless Traveler that replace and/or supplement the original App software. 2.2 Use Restrictions. The license granted to You herein is for consumer use only. You may not rent, lease, lend or sublicense the App. Any reproduction or redistribution of the App not in accordance with the terms set forth herein is expressly prohibited by law, and may result in severe civil and criminal penalties. We reserve the right to prosecute any such violation to the maximum extent possible. Except as and only to the extent expressly permitted in this Agreement or by applicable law, You may not copy, decompile, reverse engineer, disassemble, modify, or create derivative works of the App or any portion or component thereof. You may not distribute the Documentation. 2.3 Promotional Software or Materials. Notwithstanding other sections of this Agreement, App software labeled or otherwise provided to You on a promotional basis may only be used for demonstration, testing and evaluation purposes and may not be resold or transferred. 3.1 Service Marks. All right, title and interest (including but not limited to copyright, patent, trade secret, service mark and all other intellectual property and proprietary rights worldwide) in and to the App and/or associated or Documentation (including but not limited to any images, photographs, animations, video, audio, music, and text incorporated into the App software), are owned by Wireless Traveler or licensed to Wireless Traveler by third parties. You shall not remove, cover or alter any component of Wireless Traveler’s or a third party’s copyright, trademark or other proprietary notices placed upon, embedded in or displayed by the App software or on its Documentation. 3.2 Patents. The App, the systems and methods that it accesses, and/or the related services We provide are covered by one or more patents, including, without limitation, 6,701,365, 6,594,254, 6,513,066, 6,347,085, 6,226,678, 6,185,184, 6,131,121, 6,108,704, 6,009,469. All right, title and interest (including but not limited to copyright, patent, trade secret, service mark and all other intellectual property and proprietary rights worldwide) in and to the App (including but not limited to any hardware, software, computer code, graphics, images, photographs, animations, sounds, video, audio, music, multimedia, and text incorporated into the App software and Documentation), and any other component of the App or Documentation, are licensed to Wireless Traveler by third parties and are covered by various worldwide patents and patent applications that are the legal property of such third parties. use by You, nor for any harassing, threatening, defamatory, offensive or illegal messages or transmissions that You may receive as a result of using the App. We may terminate your license to use the App for any violation of the foregoing provisions. 5.1 Customer agrees to pay all applicable charges for the Services in accordance with the applicable Price List in force at the time of using the services and available on Wireless Traveler website. In particular, Customer agrees with such charges being directly deducted from its credit card account. 5.2 Wireless traveler only offers a prepaid service and all charges for the use of service will be deducted from the customer’s credit card. 5.2 Auto recharge (“auto recharge”) is the term used by company to describe its system for automatically replenishing customers account with usage credit. Customer has the option at the time of account activation to set up the auto recharge by selecting the monetary amount for the ongoing minimum account balance to be set at as well as the amount customer wishes to add to the account when account goes below selected minimum account balance. Customer also agrees all auto recharge replenishment amounts will be directly deducted from its credit or debit card account. 5.2 The applicable rates that apply for use of the Services shall be the ones duly published on the Website at the time of using the SIM Card. 5.3 Wireless Traveler reserves its rights to increase and/or make any other change to the applicable charges at any time. Wireless Traveler shall give notice by publishing any increased rates or charges on its Website. 5.4 The prices shall be quoted in US dollars and may be subject to applicable sales taxes, duties or levies imposed by any authority, government or governmental agency. Traveler makes no warranty or guarantee whatsoever that it provides its services at the lowest prices available in the market. 6.1 Wireless Traveler shall provide the Customer with national and international telecommunications services in the countries published on the “Rates and Coverage” pages of the website. Wireless Traveler will not provide a refund for any failure to make calls due to any problems including but not limited to lack of network coverage. Wireless Traveler Service operates strictly on a pre-pay basis and you will be prompted to pay in preset denominations for call/messaging airtime in advance. The airtime will expire in twelve months from time of purchase. Wireless Traveler has no obligation to refund any payments made in advance as set out in these terms. No refunds will be made for unused usage credit. 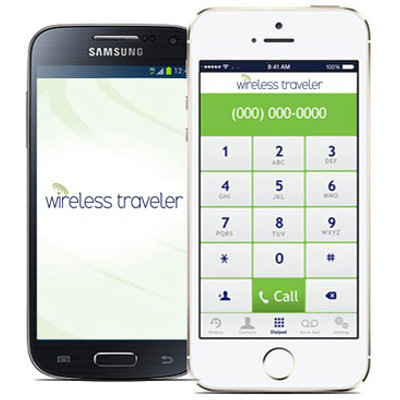 Where Wireless Traveler provides you with free calls or other special offer services no cash alternative will be given. 9.4 the Customer fails to comply with payment obligations including non payment for services which includes but is not limited to customer’s credit card authorization being declined. 9.6 for a violation of Wireless Traveler’s acceptable use policy or for other behavior that in Wireless Traveler’s reasonable discretion may be deemed to be illegal; or (vi) in order to protect Wireless Traveler, at its sole discretion, from legal liability which relates to a breach of obligation and/or warranties by the Customer. This Agreement is effective until terminated. Your rights under this Agreement will terminate automatically without notice from Wireless Traveler if you fail to comply with any term(s) of this Agreement. Upon the termination of this Agreement, you shall cease all use of the App. YOU EXPRESSLY ACKNOWLEDGE AND AGREE THAT USE OF THE APP IS AT YOUR SOLE RISK AND THAT THE ENTIRE RISK AS TO SATISFACTORY QUALITY, PERFORMANCE, AND ACCURACY IS WITH YOU. TO THE MAXIMUM EXTENT PERMITTED BY APPLICABLE LAW, THE APP AND DOCUMENTATION ARE PROVIDED “AS IS”, WITH ALL FAULTS AND WITHOUT WARRANTY OF ANY KIND, AND WIRELESS TRAVELER HEREBY DISCLAIMS ALL WARRANTIES AND CONDITIONS WITH RESPECT TO THE APP AND DOCUMENTATION, EITHER EXPRESS, IMPLIED OR STATUTORY, INCLUDING, BUT NOT LIMITED TO, THE IMPLIED WARRANTIES AND/OR CONDITIONS OF MERCHANTABILITY, OF SATISFACTORY QUALITY, OF FITNESS FOR A PARTICULAR PURPOSE, OF ACCURACY, OF QUIET ENJOYMENT, AND NON-INFRINGEMENT OF THIRD PARTY RIGHTS. WIRELESS TRAVELER DOES NOT WARRANT AGAINST INTERFERENCE WITH YOUR ENJOYMENT OF THE APP, THAT THE FUNCTIONS CONTAINED IN THE APP WILL MEET YOUR REQUIREMENTS, THAT THE OPERATION OF THE APP WILL BE UNINTERRUPTED OR ERROR-FREE, OR THAT DEFECTS IN THE APP WILL BE CORRECTED. NO ORAL OR WRITTEN INFORMATION OR ADVICE GIVEN BY WIRELESS TRAVELER OR A WIRELESS TRAVELER AUTHORIZED REPRESENTATIVE SHALL CREATE A WARRANTY. TO THE MAXIMUM EXTENT NOT PROHIBITED BY LAW, IN NO EVENT SHALL WIRELESS TRAVELER BE LIABLE FOR ANY INCIDENTAL, SPECIAL, INDIRECT OR CONSEQUENTIAL DAMAGES WHATSOEVER, INCLUDING, WITHOUT LIMITATION, DAMAGES FOR LOSS OF PROFITS, LOSS OF DATA, BUSINESS INTERRUPTION OR ANY OTHER COMMERCIAL DAMAGES OR LOSSES, ARISING OUT OF OR RELATED TO YOUR USE OR INABILITY TO USE THE APP, HOWEVER CAUSED, REGARDLESS OF THE THEORY OF LIABILITY (CONTRACT, TORT OR OTHERWISE) AND EVEN IF WE HAVE BEEN ADVISED OF THE POSSIBILITY OF SUCH DAMAGES. IN NO EVENT SHALL WIRELESS TRAVELER’S TOTAL LIABILITY TO YOU FOR ALL DAMAGES (OTHER THAN AS MAY BE REQUIRED BY APPLICABLE LAW IN CASES INVOLVING PERSONAL INJURY) EXCEED THE AMOUNT OF TWO-HUNDRED DOLLARS ($200.00). THE FOREGOING LIMITATIONS WILL APPLY EVEN IF THE ABOVE STATED REMEDY FAILS OF ITS ESSENTIAL PURPOSE. BY DOWNLOADING THE APP, YOU AGREE THAT WIRELESS TRAVELER ALONE (AND NOT ANY UNDELRYING PROVIDER OR LICENSOR) IS AND SHALL BE RESPONSIBLE AND LIABLE TO YOU. enforce these provisions directly against You on its own behalf. This Agreement shall be governed and construed in accordance with the laws of New York. You agree that in any legal action or proceeding between you and Wireless Traveler for any purpose concerning this Agreement, you agree to submit to exclusive jurisdiction in Suffolk County New York and you expressly waive all defenses to jurisdiction. Any cause of action or claim You may have with respect to the App or Documentation must be commenced within one (1) year after the claim or cause of action arises or such claim or cause of action is barred. Wireless Traveler’s failure to insist upon or enforce strict performance of any provision of this Agreement shall not be construed as a waiver of any provision or right. Neither the course of conduct between the parties not trade practice shall act to modify any provision of this Agreement. We may assign our rights and duties under this Agreement to any party at any time without notice to You. You may not export or re-export the App to any destination requiring such a license. You acknowledges that the Service may not be exported or re-exported to Cuba, Iran, Iraq, North Korea, Libya, Sudan, or any other country to which the U.S. prohibits the export of goods, technology or products, or to nationals of those countries wherever located. This Agreement constitutes the entire agreement between the parties with respect to the use of the App and Documentation licensed hereunder and supersedes all prior or contemporaneous understandings regarding such subject matter. No amendment to or modiﬁcation of this Agreement will be binding unless expressly intended to do so by Wireless Traveler. Any translation of this Agreement is done for local requirements and in the event of a dispute between the English and any non-English versions, the English version of this License shall govern.